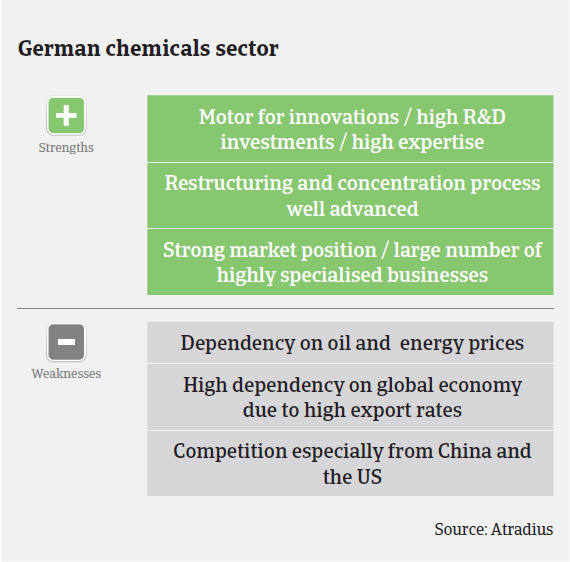 German chemicals/pharmaceuticals businesses have a strong market position, and many are highly specialised. The industry has a well-deserved reputation for innovation and a competitive edge. According to the German chemicals association VCI, production increased 0.6% and turnover rose 0.1% in 2014. In 2015, the VCI expects production to increase 1.5% and turnover to decrease 0.5% (including pharmaceuticals). Excluding pharmaceuticals, production is expected to increase 1.0% and turnover to decrease 1.5%. The decrease in turnover is due to the increased international competition which forces chemicals businesses to immediately pass on lower commodity prices to customers. Chemicals sales prices are expected to decrease by more than 2% in 2015. In Q1 of 2015 organic basic chemicals accounted for 45% of the production value, followed by petrochemicals (22%), fine and specialty chemicals (20%), polymers (13%), inorganic basic chemicals (10%) and detergents and personal care products (7%). The pharmaceuticals sector accounted for 30% of production value. 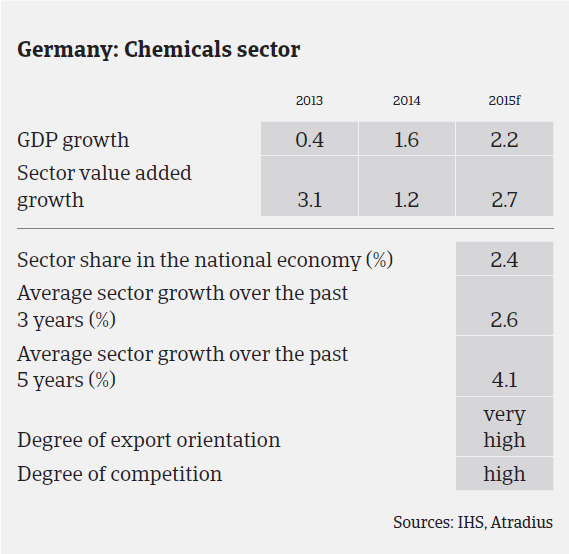 German chemicals/pharmaceuticals businesses generally have a strong market position, and many are highly specialised. In addition, the industry’s considerable investment in research and development has given it a well-deserved reputation for innovation and a consequent competitive edge. Generally, German chemicals and pharmaceuticals businesses have robust equity, solvency and liquidity. Profit margins in the chemicals sector are stable overall, although they are influenced by global oil prices. Profit margins in the pharmaceuticals sector are still satisfactory but are shrinking in the domestic market because of the health regulations introduced in 2010. Since then, a number of patents have expired leading to a decline in both turnover and profits from these products. However, pharmaceutical research based manufacturers compensated for this with intensified research and mergers and acquisitions. The German chemicals and pharmaceuticals sector’s payment behaviour has always been better than average with no notable payment delays, even during the 2008/2009 economic crisis. In our experience payments take, on average, 45 days – even fewer for domestic payments, as most chemical and pharmaceutical products are exported to destinations with longer payment terms than the domestic market. We have seen no change in payment behaviour or increase in notifications of non-payment in the last six months and expect this pattern to continue in the coming months. This should be accompanied by fewer insolvencies in the sector: both chemicals and pharmaceuticals have a lower insolvency rate than other German industries. 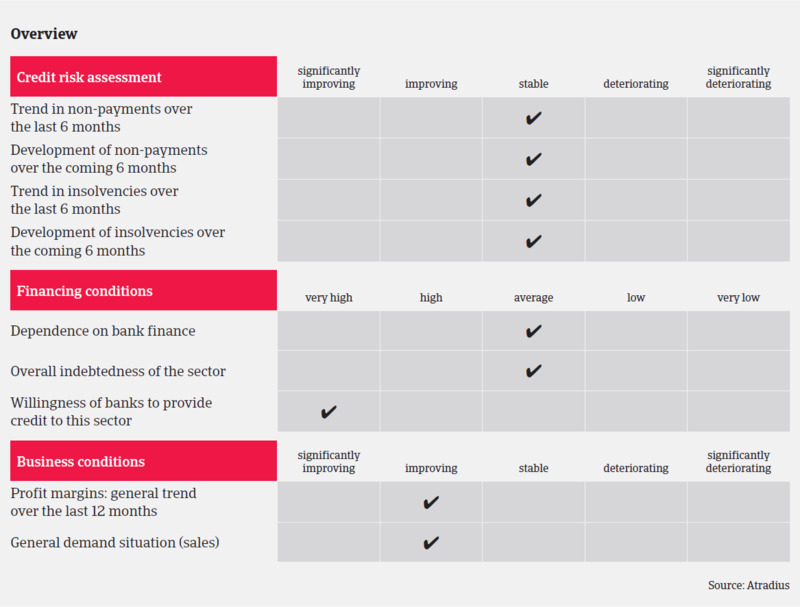 Our underwriting stance for this sector remains generally relaxed, with normal external monitoring and buyer reviews. However, we pay additional attention to buyers who depend on more critical sectors, such as photovoltaic, which has been affected by insolvencies and restructurings because of reduced public subsidies and strong competition from China.